*** DON'T MISS***21st July to 28th July now available due to last minute cancellation. 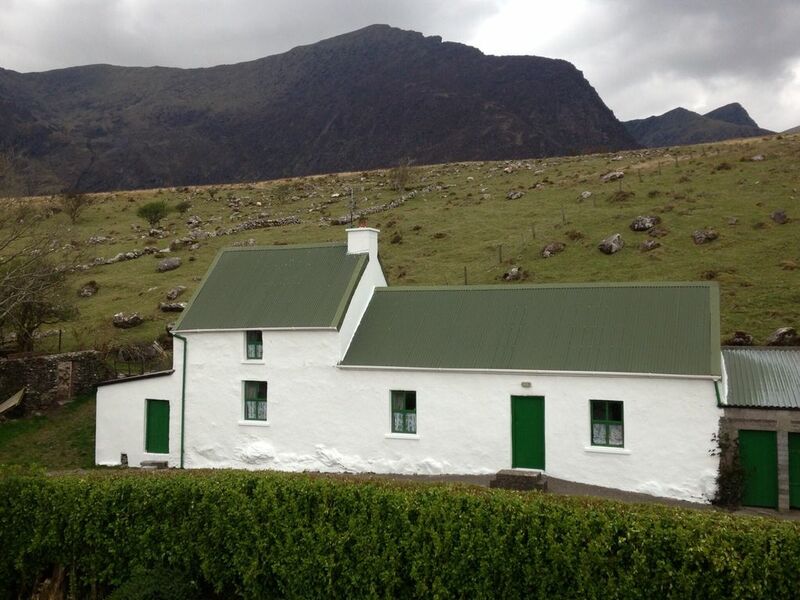 This 200 year old farmhouse is situated on the northern side of the DINGLE Peninsula. It is tucked in at the base of Mount Brandon the second highest mountain in Ireland. It overlooks Brandon Bay which opens into Tralee Bay. It is located 1½ miles from Cloghane Village and is an ideal area for visitors who like the quiet life of walking, of fishing and other outdoor pursuits and who warm to the charms of sleepy villages with small, cosy pubs and even smaller shops. The Cloghane-Brandon area has immense appeal. Our Cottage is located at the foot of Mt Brandon and overlooking Brandon Bay. It is a truly beautiful place where you can totally switch off from the busyness of life and totally unwind. It is our personal place of retreat and is a very special place which we call our heaven. Our cottage has been passed on to us and contains many original items of previous generations. We renovated the house and preserved the original look and ambiance. It is a warm and cosy retreat for any family and will take people back in time with the old fireplace and traditional crane that used to carry the kettle and pots over the open fire. The picture of the cottage very deceiving as there is a bungalow directly in front of the property. We had a 4 month old baby with us and not impressed with the cot supplied. This was a timeshare exchange and was not up to the usual standard of timeshare properties. Ideal for walkers and locals all very friendly, weather was kind to us and therefore out everyday, scenery brilliant, walks good. Our traditional Irish cottage is located on the foothills of Mt Brandon. There is another residence located in front of our cottage but at a lower level as it too is on the Mountain Side. The views around are spectacular. The view of our cottage with the mountains in the background is as it is and most guests are blown away with the views and tranquility.Unfortunately there was a small stain on the mattress of the cot which we made available for this family and we apologised for this. We are very disappointed with this anonymous review especially since 99% of our reviews score a 5 Star.The description of our cottage states that it is a 200 year old cottage and obviously does not have ensuite bedrooms and marble tiled floors. Our cottage is full of Olde World charm and character with a traditional fireplace where turf can be burned and still has the traditional crane that carried the old kettles and pots. Our cottage is very cosy and suits a couple or family but probably too small for 6 adults.Our cottage is ideal for walkers and exploring the Dingle Peninsula and gives a great opportunity to meet locals in the pubs for music sessions. I arrived from New York to Loch Cruite cottage in awe of the beautiful setting nestled at the foot of Mt Brandon. The cottage is located on the Dingle Penninsula adjacent to mountains and beaches with a culture immersed in history and tradition. It was everything I pictured the Irish countryside to be. While the cottage is situated on a working sheep farm it is also located near two small villages and a driving distance to Dingle Town. O Connors Pub in Cloghane village served us a delicious home cooked meal and a great pint! We were surprised and delighted to see Paddy the owner of our cottage ( a great musician) having a traditional music session at O Connors one night. What a fantastic evening. In Brandon there is a beautiful old pier surrounded by sandy beaches for many miles which kept my kids busy for hours on end. At the top of the pier there is Murphys's Pub another great traditional spot. Loch Cruite cottage is a perfect location for exploring the Dingle Penninsula with it's variety of water sports and horse riding amenities. My children also got to participate in farm life with farmer Brendan answering their endless questions. Weather was beautiful and contrary to popular belief there was no rain. A great trip... 5 stars! This is a definite for my future vacation plans. It was a pleasure to meet with this family from Long Island, New York at the end of August. They definitely explored the Cloghane/ Brandon Region as their children were full of energy and the Mt Brandon climb was so easy for them all. Weather was fantastic for their week in our Cottage.hopefully we will see them return soon again as they seemed to love the Irish Culture especially the music in our local pubs and restaurants.